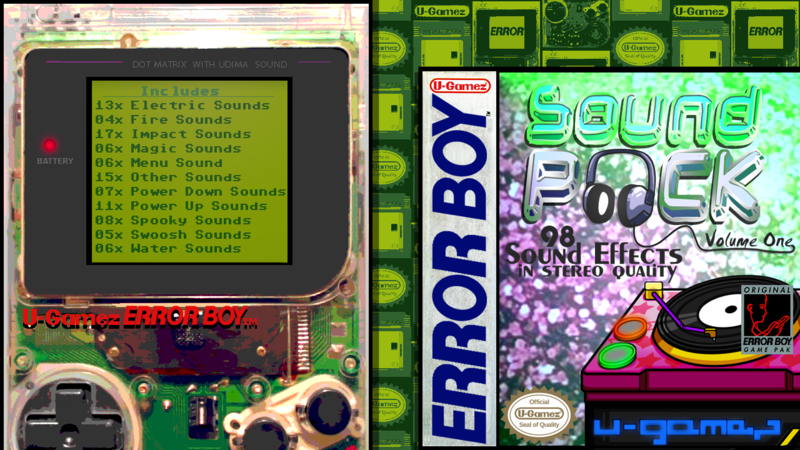 This is a collection of sound effects in the style of a classic 8-bit Gameboy soundchip. I made these sounds by myself using a few different virtual instruments in FL Studio. I made a free add-on pack with 34 additional sounds! in 16 bit PCM wave (some mono, most in stereo) . Any way you can accept Paypal? My bank won't allow me to pay internationally without a currency-conversion middle-man. I have a donation page for my Twitch channel, maybe that could work for you. If you can donate there I'll send you the pack manually! My bank still won't allow the transaction because the receiver still requests euros with no conversion option. If you have a way to accept a paypal payment on another platform other than paypal, I can do it, but otherwise, unless the transaction is in USD, my hands are unfortunately tied. I'm very interested in your pack, still. Send an email with your itch.io user name to ugamezgermany[at]gmail[dot]com and I'll send it to you. Wow, Thank you! I will shoot you an email in just a bit and once I go through the pack, I'll post everywhere I know to (twitter, OGA, here, mostly) about it! Do you have any particular preference to anywhere else I should post a review? I did not receive an email yet, if you're still interested write a mail to ugamezgermany[at]gmail[dot]com!